In our times, we are very comfortable with dates. We say, “Oh, that happened in 1862.” However, in the Middle Ages, many folks were not aware of the year: they lived life according to the liturgical seasons. 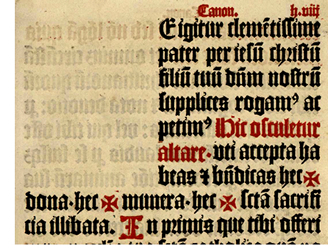 This is just another thing that makes it hard to know when liturgical MSS were written. Also, sometimes the MSS were not completed in a year, but over a period of time. Furthermore, books were so rare that they were often used for a long time, with additions written in. Finally, all the wars and fires and famines that happen down through the centuries also tend to confuse the origin of books (as we can imagine!). One of the greatest experts in Gregorian chant explained to me several years ago that (to a large degree) the problems “dating” MSS have been solved by comparison of handwriting and formation of letters (paleography). However, not all of us are experts in this field (obviously), and sometimes we come across a MS that has no date assigned to it. I certainly don’t doubt that paleography is the best way, but I know that we can also learn some “clues” by other methods. For instance, I currently have photographs of a MS that has no date assigned. It might be amusing to look at a feature or two and see what can be deduced. First of all, here is the same section of the Canon we looked at yesterday (upper right). We notice some cool abbreviations (especially of the letter “m” which takes up so much space), and also the rubrics (in red) that say to kiss the altar and make the sign of the Cross. Others, smarter than I, could probably date the MS based on that excerpt alone. The next excerpt shows a little more. First of all, we see clearly that this is a Missal (not a Sacramentary) that contains all the parts of the Mass (Missale plenarium), even those sung by the choir. This would strongly suggest a date later than 1200 (AF, 190). 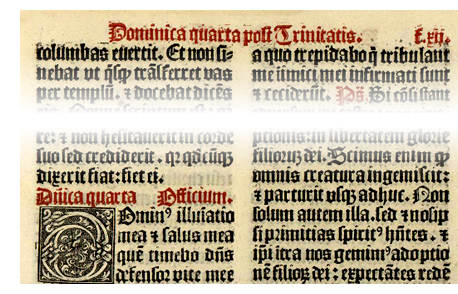 The Introit (Dominus illuminatio mea) is called “officium,” and this is a characteristic of the Sarum rite (a mediæval derived rite, whose parent is the Roman rite). Its text does not match our current Introit for that Sunday, which is typical of the Sarum rite. Also, “Sarum counted Sundays not after Pentecost, but after Trinity, a late and altogether indefensible practice” (AF, 203). 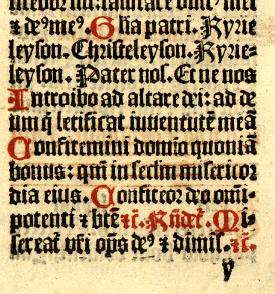 We note that feature in this MS. There are numerous other clues of a “Sarum” MS, especially the insertion of the Kyrie and Pater Noster before the Confiteor. I encourage you to read the entire passage (see below for more information). 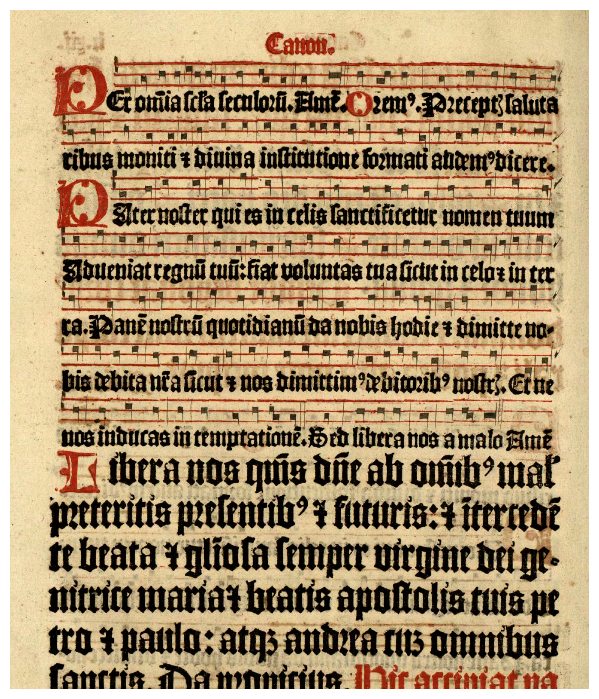 Finally, if the other clues were not enough, looking at the musical notation in the Missal, it is possible for me to make an educated guess about the MS. I would guess that it was written around 1400. Hopefully I am not too far off.